Please note this page may load slowly because I have tried to keep the photos taken at Budds Beach as large as possible for your enjoyment. 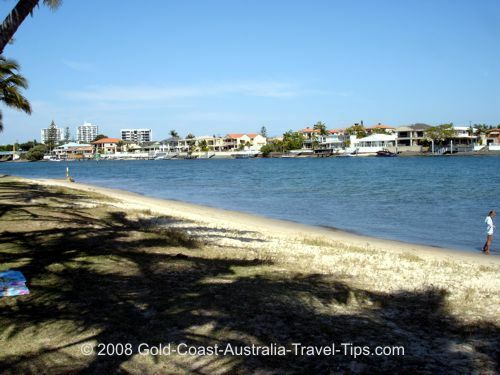 Budds Beach is a part of Surfers Paradise that for me is very photogenic! I love popping down on a sunny day and snapping this tranquil spot. 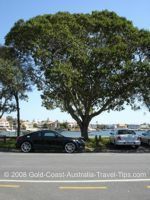 Here are some of the photos I have taken at Budds Beach. 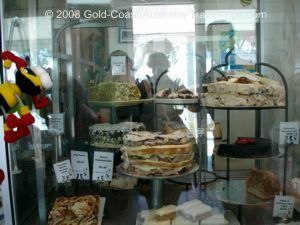 I also cannot go past a coffee and cake at Bumbles Cafe and a quick look at what SuGa SuGa has to offer! I've put them right at the bottom of the page, but I also seem to get a creative urge whenever I am taking Budds Beach photos. 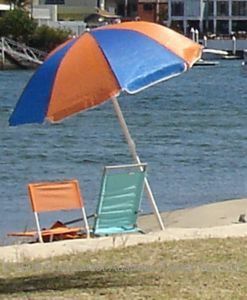 I call this shot Budds beach umbrella. This photo looks like I set it up - I didn't! We arrived to have a coffee one day to find this kindly set up for us! 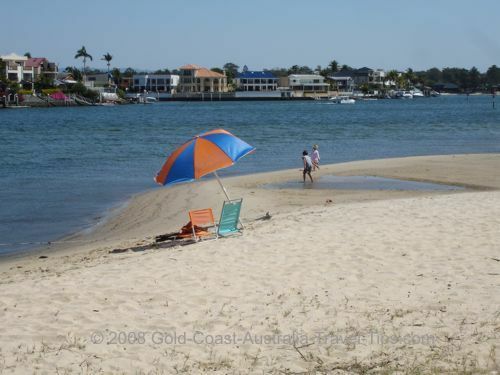 This picture really says it all about the relaxed atmosphere on this beach. 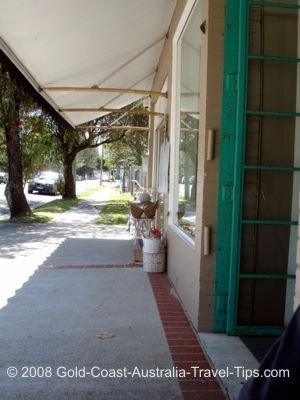 This shot is to show you that there are palm trees at Budds that you can use for shade. 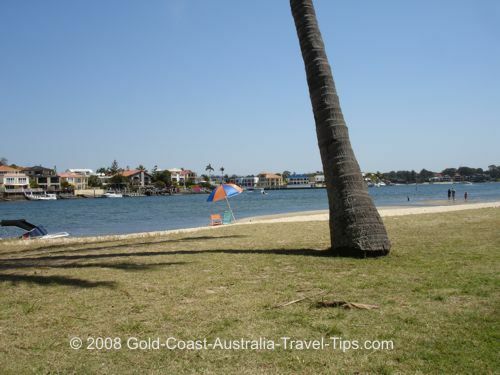 Budds Beach looking across Nerang River to the houses on Chevron Island. large houses, waterfront and often a rather nice boat moored on the jetty. Ah this is the life! 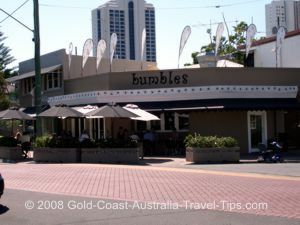 Bumbles Cafe at Budds Beach is definitely worth a visit. 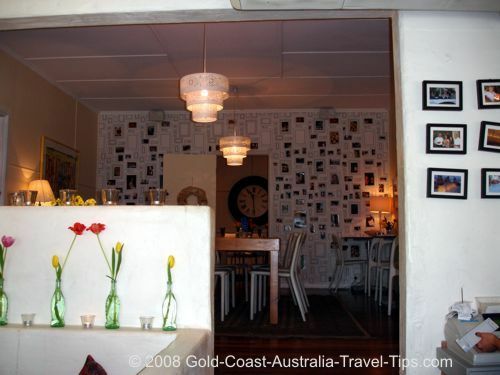 Inside Bumbles at Budds Beach - the atmosphere is so friendly and inviting, you can't help but linger here. No need to worry there is plenty of inside seating. 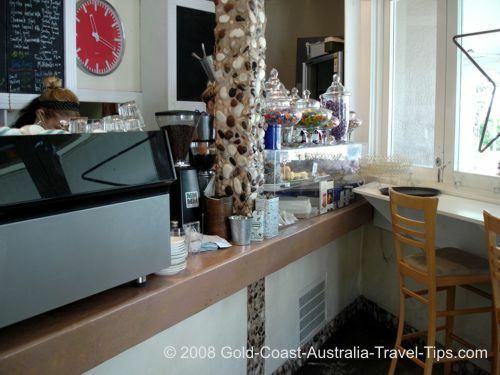 popular spot for breakfasts, lunches and coffee and cake. but these cakes are just something else! I share the carrot cake with my husband. ourselves to work through the cakes - but the carrot cake keeps calling. This streescape is looking from Bumbles past SuGa SuGa. 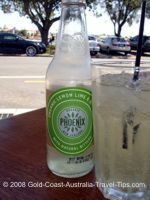 It feels like a perfect mix between Australian and European. on the next table, we could have been almost anywhere. 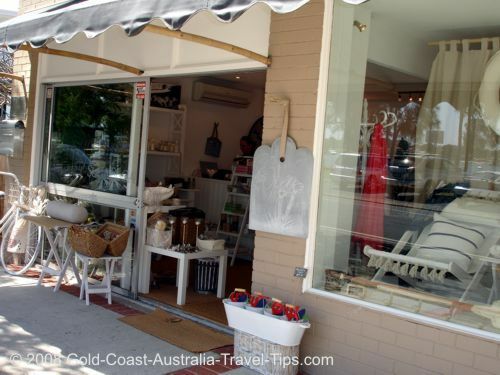 SuGa SuGa has some lovely items from both Australia and around the world - you might find a really novel souvenir to take home. I can almost not believe I took this shot. something in the air at Budds! 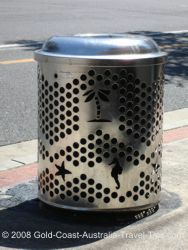 And with a rubbish bin I finish off my Budds Beach photos. I hope you have enjoyed them. Don't forget to share this page with your friends if you enjoyed it. 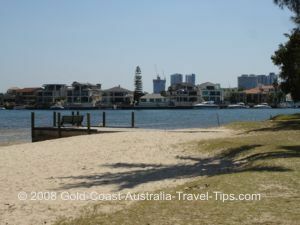 Make sure you visit Budds Beach when you are in Surfers Paradise and then let me know what you think. 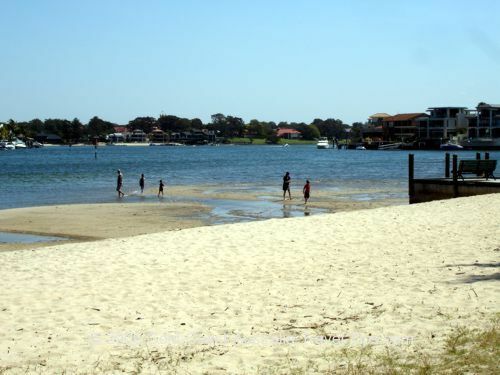 If you want somewhere great to stay in Budds Beach recommend Trilogy Apartments.